The floods come bigger and more often these days in North Carolina. On the fertile coastal plains and wetlands of the eastern part of the state, water is central to nearly everyone’s livelihood. Waterways knitted together small Native and early colonial communities and, later, nurtured a thriving textile industry. Generous rains still irrigate big industrial farms and small family plots. But in just the last two years, the mostly poor region has also borne two historic floods: Twice-a-century events that have begun arriving annually. Hundreds of miles away in the backwoods and bayous of coastal Louisiana, history seems to be accelerating, too. The region was already saddled with environmental toxins from a petro-chemical industry that decimated the region with 2010’s Deepwater Horizon disaster. And 2016 brought the displacement of the country’s first seawater rise refugees. Water made Louisiana the jewel of colonial America’s inland empire; now it threatens whole swaths of the state. Southern communities are on the front lines of an ongoing global climate crisis, one whose threats grow in scope and magnitude each day. In many ways, Southerners have been among the first to learn what it’s like to live with a new climate – the more hostile one we have created for ourselves over decades of living outside our planetary means. More intense storms, hastening sea level rise, agricultural disturbances and other climate factors present an existential threat to Southern communities and an uncontainable, exponential one for the country. Many Southerners know this; they understand the threats and their enablers in concentrated, reactive, corporate-backed power. Although many of those same Southerners are organizing and mobilizing around a resilient and just new future, foundation investment in Southern communities does not match that reality. On Fertile Soil, the first in the series, explored Southern nonprofit leadership and the biases and misperceptions of both Southern and national philanthropists that have led to effective, leaderful Southern organizations being overlooked by most grantmakers. Contextualized in the fertile Black Belt and Mississippi Delta regions, the report pointed out the ways racism, sexism and prejudice can disadvantage some of the most investable Southern organizations. Strong Roots, the second report, highlighted the structural change potential that lies in investments in community-led economic development in the South, with a specific focus on Appalachian Kentucky and Coastal South Carolina. Economic transition is well underway across the South, where old industry has collapsed, new industry has blossomed and an economic system of exclusion and exploitation remain the norm. Hille’s quote refers to the difficult economic and social transition away from a coal economy that has been rocking the Appalachian South for years, but it could just as aptly be said about the transition to a new climate already underway globally. Weathering the Storm, the latest installment in the series, continues the first report’s exploration of building power and the second’s examination of building wealth and looks closely at building resilience. There will be a transition to a new, and in many ways more hostile, climate that could result in disproportionate harm to already struggling communities. In the South, the work to avoid a transition that results in disproportionate harm to already struggling communities is well underway. Weathering the Storm explores the intersection of economic, environmental and social systems where the Southern movement for climate resilience is growing. It will make the case that funders concerned about threats from our changing climate are missing a crucial opportunity to invest in solutions of national and global relevance if they are not investing in Southern organizations and networks. “Speaking for myself, the notion that ‘as the South goes, so goes the nation’ is key. We’re not trying to stop ship building or oil extraction or Mississippi River operations in New Orleans. But hopefully by thinking about water management and other emergent sustainable industries, we can make the economic case for them and have proof that equity is a growth strategy. “And if we’re able to do that here, then maybe we can do it with transportation, trade and logistics and other legacy industries in our region. And if we can do that then we’ll be a model for elsewhere in the South and elsewhere in the country and elsewhere in the world. — Liza Cowan, JPMorgan Chase & Co. Although Eastern North Carolina and Southern Louisiana are in very different parts of the South, they share many of the same challenges that stem from their locations in coastal lowlands threatened by climate change. Both regions have land- and water-dependent economies such as agriculture and commercial fishing. Small farmers and commercial fishers have seen the impacts of development on the vitality on the natural resources they depend on. Both regions are home to large, diverse communities of color with significant Black and Native communities as well as growing Hispanic communities. The political landscape in their respective states is different, and Southern Louisiana includes large urban areas – New Orleans and Baton Rouge – while Eastern North Carolina does not. But the similarities in each region’s experience with environmental challenges brought on by climate change and extractive industries make them a useful lens through which to explore those issues in the South. Between 2010 and 2014, foundation support for communities in Eastern North Carolina and Southern Louisiana did not meet the challenge presented by environmental threats, nor did it capitalize on the opportunities for long-term structural change that are growing at the grassroots in these two regions. These statistics present a significant missed opportunity. In Leveraging Limited Dollars, NCRP research has demonstrated a return on systemic change investments of $115 in public benefits for each $1 invested in those strategies. Foundation support for marginalized communities was troublingly low between 2010 and 2014, too. For example, 0.5 percent of total funding in Southern Louisiana and 0.2 percent in Eastern North Carolina was designated to support Hispanic communities. In Southern Louisiana, 7 percent was designated to support African-American communities, and in Eastern North Carolina that number was just 2 percent. In Southern Louisiana, about one-third of the population is comprised of people of color, and in Eastern North Carolina that number is nearly one-half. In both regions, about three-quarters of foundation funding between 2010 and 2014 was invested in either health, human services or education. 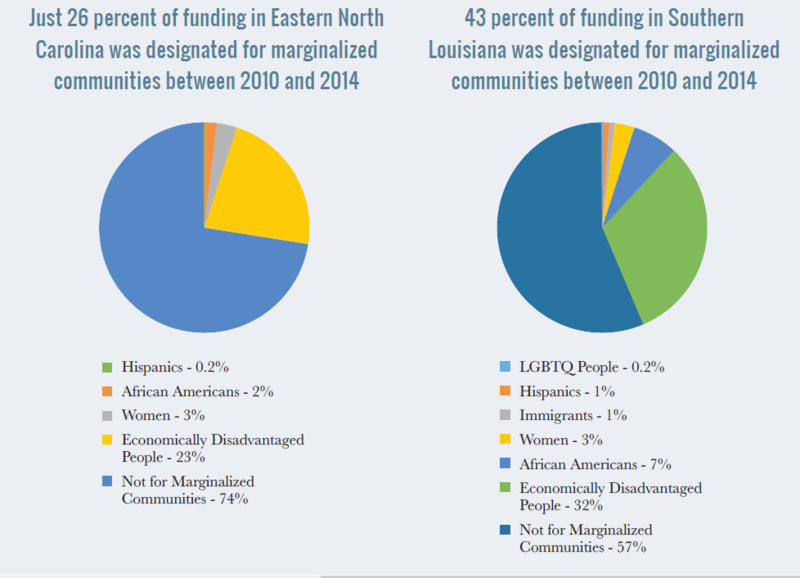 In both regions more than half of funding was not designated to benefit any marginalized community. The total foundation funding flowing to these two regions lags well behind other parts of the country in per capita grant dollars. New Orleans has been the focus of national philanthropic attention since Hurricane Katrina, and its per capita funding shows that clearly. But Southern Louisiana (when Orleans Parish is excluded) and Eastern North Carolina saw per capita foundation investments of less than $70 per person between 2010 and 2014. Nationally, foundations invested $451 per person during the same period. The scientific community is confident beyond doubt that global climate change is underway and that it will continue – perhaps accelerating quickly in the coming decades – for the foreseeable future. Academics and government experts have known that for some time, but predicting the specific economic impacts of climate change on regional and local levels had, until recently, been elusive. But, in June 2017, Science magazine published a peer-reviewed study that constructs the first comprehensive predictive model of global climate change’s economic impacts on the local level. The authors concluded the South would be most negatively affected. One climate scientist described the prediction as a “large transfer of wealth between states,” with impacts from dangerous heat, sea level rise and other effects battering the economies of Southern states and giving a slight boost to many in the north and west. More specifically, the study predicts that climate change’s negative impacts will fall disproportionately on the poorest counties in the country, many of which are in the South and many of which are home to large communities of color. The lived experiences of folks residing and working in the coastal plains, wetlands and barrier islands of the South would corroborate this research. And especially to those who lived through any of the handful of historic tropical storms that have socked Southern communities in the last 20 years, the news matches hard economic data to difficult memories. *Orleans Parish and the city of New Orleans are coterminous. For the purposes of analyzing funding data, NCRP has separated Orleans Parish from the surrounding Southern Louisiana region in some places because New Orleans has historically been the recipient of a large majority of funding to benefit the Southern Louisiana region. Photo by Bill Metcalf Photography, used under Creative Commons license. Donna Chavis, co-founder of CCA (and Legerton’s spouse), views disaster recovery from the perspective of neglect and exclusion. Because federal and state disaster response leaders exclude marginalized Southern communities from conversations about how to recover from a storm, they are negatively impacted by policy decisions, too. According to Chavis, when Eastern North Carolina communities responded to Hurricane Matthew many state and county officials advocated for rezoning plans that would level historic Black communities to make way for parkland and recreational areas. While recognizing the challenges of institutional abuse and neglect in communities of color, Chavis, a member of the Lumbee tribe, is well aware of the gains made in Native American and African American communities in Eastern North Carolina and across the Rural South over the past 30 years, particularly in the area of environmental justice. She brings a deep well of experience and knowledge to her work in Eastern North Carolina. On the national level, she served on the Commission for Racial Justice of the United Church of Christ, the planning committee of the historic 1991 First National People of Color Environmental Leadership Summit, and chaired the boards of the Jessie Smith Noyes Foundation and the Fund of the Four Directions. She was also the founding director of Native Americans in Philanthropy. The impacts of worsening environmental crises in the South have left a legacy of trauma that divides Southern communities and impairs their long-term climate resilience. Although these communities are not defined by this trauma, funders and organizers alike must understand it in order to begin addressing it. Government and philanthropic responses to acute environmental crises like historic tropical storms are representative of the same sector’s responses to our ongoing, long-term climate crisis. CCA recognized this when it first organized as a nonprofit in North Carolina 37 years ago. Its proactive solution was to ensure from the beginning that CCA’s leadership would reflect the communities it served. “The leadership at the Center had ideas about what to do but the very first active months of meetings were predominantly in church basements – countywide community gatherings where there were small group discussions. The organization was triracial in its staff in the beginning because at that time [the community] was almost exactly one-third Native American, one-third African American and one-third Caucasian. So the staff started that way, too. We had one salary, and we divided it three ways,” Chavis said. CCA is one of the oldest multiracial grassroots social justice organizations in the South and the nation. It is situated in one of the poorest and most racially diverse rural counties and regions in the nation. Faced with the dual disasters of intensifying storms and a proposed natural gas pipeline, more and more its work is “glocal” – implementing effective and successful organization and pursuits that combine local with regional, state, national and global issues and solutions. Despite what Legerton described as the “deconstruction” of rural North Carolina communities over the last several decades – the effects of criminalization, economic disinvestment and environmental degradation – both he and Chavis emphasized the deeply rooted resiliency pervasive in the region. The deep-rooted resilience present in Southern communities emerged in many of our interviews. Still, our nation’s comfort with racialized and entrenched poverty echoes historical struggles with racism, classism and deprivation, threatening to undermine that resilience. John Davies, president of the Baton Rouge Area Foundation, spoke about that challenge and about the disruption climate change will wreak in Southern Louisiana. Davies went on to explain that, in the face of these existential challenges, communities in Southern Louisiana have grown closer, more trusting of each other and better able to meet the threat head-on. Community cohesion – the ability of communities to rally around a shared understanding of its challenges and co-strategize around solutions – will be essential to places across the South and across the globe that are threatened by climate change. The deepening climate crisis will present an existential threat to many communities, and divisions along lines of race, class and other factors will undermine our collective response. NCRP’s conversations with Southern nonprofit leaders indicated that they consider themselves well-positioned to build that cohesion, drawing on the region’s culture of mutual aid and relationship-oriented community organizing. But entrenched poverty, and especially poverty that disproportionately has an impact on communities of color, has and will continue to challenge those efforts. “In general we live in a racially defined world. The parish I live in is 50-50 black and white. There is a growing middle and affluent African American class here. But there is still a dominant and very poor Black economic layer to our community. It’s ever-present and we’re hyper-aware of it; it’s just a reality of life. It strikes me that because it is such a prevalent part of our lives, we’re very comfortable with this reality,” Davies said. LIZA COWAN, EXECUTIVE DIRECTOR, and ERIKA WRIGHT, VICE PRESIDENT GLOBAL PHILANTHROPY – JPMORGAN CHASE & CO.
Southern communities have the opportunity to respond to climate change threats with coordinated planning processes that bring together government, business, community-based organizations and residents to ensure the voices of marginalized communities most impacted by environmental challenges are not excluded from these conversations. Representing the philanthropic arm of a bank with a large footprint in the region, Liza Cowan, Erika Wright and their colleagues at JPMorgan Chase are in a unique position to bring diverse partners together around a vision for an economic future where opportunity is available to all Louisianans, regardless of race or class. Though not specific to climate resilience, the foundation’s work often involves supporting that planning process and ensuring community voices have strong representation. Wright explained that representation within the nonprofit sector and especially in cross-sector collaboration is challenging, but folks in Southern Louisiana are gaining practice doing it well. Wright and Cowan are not the only folks in Southern Louisiana who described a marked shift in the quality and tenor of nonprofit-government-business collaboration since Hurricane Katrina. But the sense of emergency that often accompanies climate resilience collaboration, especially in light of the real and urgent physical threat to already vulnerable communities like Isle Jean Charles, can be a challenge. JPMorgan Chase’s work in Southern Louisiana has evolved through their engagement in the Greater New Orleans Funders Network. In 2015, around the 10th anniversary of Hurricane Katrina, JPMorgan Chase and several other regional funders co-founded the network out of a desire to better align investments in Greater New Orleans for long-term change. One of the network’s greatest assets is the opportunity it provides grantmakers like JPMorgan Chase to deepen relationships with local and national funders who bring to the table a strong analysis of the ways race, class, gender and other factors impede equitable economic growth in the region. The role of corporations in the marketplace can complicate any narrative about corporate philanthropy. Cowan said JPMorgan Chase Foundation’s philanthropy and their corporate responsibility work is guided by a central value: Equitable growth is the best, most sustainable way to increase prosperity – in the South and nationally. “We’ve been really intentional about continuing to sit at the table with folks who are not necessarily investing in underrepresented populations and being the voice that says ‘Why don’t we invite these folks here?’ and ‘How is this strategy addressing the disparities that we know exist because we have funded the data that shows it?’ We’ve been intentional about saying ‘OK, who are the organizations that are working with women, working with people of color?” Wright said. At the same time, the threat posed by climate change in Southern Louisiana is an opportunity for the region to prove the feasibility of a regional response to coastal crises and to prove the centrality of equity and inclusion to any climate change funding strategy, Cowan and Wright pointed out. “Because of that interconnectivity between and among [Louisiana communities] because of the bipartisan agreement around the coastal master plan, because of the funding available and because of our long history of working on the coast and having to manage living with water and wetlands, we have this asset in terms of [the region’s] knowledge that can be transformed to be a knowledge-based export industry to other communities around the world that are facing this threat,” Cowan said. As its philanthropy has evolved in recent years, JPMorgan Chase has strived to deploy the company’s resources – people, data and partnerships – to ensure greatest impact in line with values of strategic philanthropy. Updated 2/5/2018 to correct spelling of Naeema Muhammad’s name. Naeema Muhammad and her colleagues at the North Carolina Environmental Justice Network (NCEJN) understand how and why local private and public sector leaders often exclude grassroots environmental organizations from conversations like the ones Liza Cowan and Erika Wright spoke about. As heirs to the legacy of longstanding environmental justice organizations in Eastern North Carolina, NCEJN represents the potential for building a diverse, climate-resilience movement that builds the power of people to advocate for themselves. NCEJN has grown out of a people-of-color-led movement in North Carolina to emphasize the disparate impacts of environmental challenges in Black, Native and Hispanic communities. Their focus on protecting people and communities with the least wealth and power in the state has often been met with intransigence and neglect by more powerful nonprofit sector actors, elected officials and business representatives. Muhammad went on to describe a specific example when government and business representatives who ought to have been collaborating with community partners – like NCEJN – instead sowed division. Commercial agriculture has deep, long-term negative impacts on environmental and public health in Eastern North Carolina, but messages like the one in Muhammad’s example resonate in small communities where agriculture is a major source of stable work. Compounding that challenge, Muhammad explained, is the extent to which commercial agriculture (and other industries with harmful environmental effects) have captured the levers of policy and regulation. The NCEJN’s perseverance has earned it the respect and attention of bigger, better-resourced environmental groups that have shifted their focus to address the human costs of environmental degradation and climate change. But those large environmental groups’ newfound solidarity warrants close examination, added Muhammad. In the course of researching this report, Muhammad and NCEJN were not the only Southern environmental justice groups to raise concerns about the depth of larger environmental organizations’ – funders and grantees – commitment to the justice part of the work at hand. And their concerns carry a rich history of self-determination and grassroots activism that began in the South. The modern environmental justice movement – with its focus on disparately impacted communities and on the power-building necessary in those communities to achieve lasting impact – has some of its deepest roots in the South. In fact, scholars of the movement’s history locate its origins in Eastern North Carolina. In the 1970s, the mantle of “environmentalism,” which had historically been associated primarily with middle- and upper-class white activists, was claimed by residents in Warren County, North Carolina. Groups like NCEJN, CCA and close partner organization Concerned Citizens for Tillery are the direct heirs of that pioneering work. But, as Muhammad pointed out, too often larger, better-funded environmental organizations either under-invest in Southern organizations that defined (and continue to define) the modern movement, or they engage with those organizations cynically out of a desire to exploit their well-earned reputation to the big green groups’ advantage. Mikki Sager, director of The Conservation Fund’s Resourceful Communities program in North Carolina, spoke about the impact of investing in capacity and building a resilient grassroots nonprofit infrastructure to mirror the resilient communities necessary to meet the climate change challenge. Part of Resourceful Communities’ success can be credited to Sager’s nimble way of connecting issues larger foundations have prioritized back to the South’s natural resources. At the center of this holistic and intersectional understanding of environmental preservation is the power of land to restore communities, right past wrongs and build wealth, power and climate resilience. =“Environmental funders are the few folks in the philanthropic sector that are investing in rural places and they often give big chunks of money to buy land,” Sager said. “One of my colleagues made a map of the biodiversity hot spots and the [USDA-designated] persistent poverty counties. Not all biodiversity hot spots are home to the persistent poverty counties, but persistent poverty counties are consistently home to biodiversity hot spots. Southerners’ connection to the land is a deeply held regional tradition, and capitalizing on the productive potential of land to benefit all Southerners is at the root of Resourceful Communities’ partnerships with funders who may not otherwise prioritize environmental funding. It also means partnering with traditional environmental funders to invest in innovative community economic development strategies as a means to protect ecosystems. Sager tied Resourceful Communities’ work back to a long history of environmental racism whose negative impacts will be amplified by our changing climate. Resourceful Communities is a grantmaking intermediary organization. Sager and her staff help grassroots organizations across the South –especially in North Carolina – access funding and capacity-building tools and support. They also do it on those organizations’ terms, making sure the philanthropic investments do not overburden organizations with onerous requirements and restrictions and that capacity-building tools are tailored to their needs. Resourceful Communities describes it as a triple bottom-line approach. Resourceful Communities’ approach gets crucial philanthropic capital to underinvested parts of the South, and it attracts other funders to the table. By building capacity, investing in grassroots organizations and connecting those organizations to strategic partners and other sources of funding, Resourceful Communities is building a resilient “triple bottom line” nonprofit ecosystem in an area where resources for such an ecosystem have historically been scarce. The prevalence and real value of mutual community aid, emphasized over and over in our interviews across the South, makes philanthropic investment in Southern communities high-leverage investments. Sager shared one of Resourceful Communities’ many stories of impact. During post-hurricane recovery in Sampson County, North Carolina, the federal government funded a project to clear a critical waterway of fallen trees and other debris. The debris had caused damaging floods, especially on land where the Coharie tribal members live. But the recovery project received funding to clear debris only on parts of the river adjacent to white landowners. Resourceful Communities partnered with the Coharie to connect them with the North Carolina Forest Service, which invested $6,000 in Coharie-led recovery work. The tribe bought equipment, and by restoring the waterway, which has significant cultural significance for the community it avoided further damage to its land and helped the young people who worked on the project gain valuable skills and reconnect with their heritage. After three years and $20,000 total in grants from Resourceful Communities and support from the University of North Carolina American Indian Center, the Coharie Tribe recently secured a $250,000 contract from the North Carolina Department of Agriculture to continue the work with the potential for developing it into a workforce training program. Sager and her colleagues at Resourceful Communities bring a deep understanding of the structural issues that will exacerbate climate change’s impacts on Southern communities to their work. But another crucial ingredient in their success has been their capacity for high-impact, high-leverage intermediary re-granting that is done with integrity and equity in mind. Equity: “You need team members who understand power, privilege, race, class and equity and who understand and are willing to address pervasive institutional racism.” And you have to be willing to use an equity lens to evaluate your work, especially to take a hard look at your grantmaking and where your other resources – like funding and staff time – are going. As an intermediary in close relationship with funders and grassroots grantees, standing at the intersection of economic, social and environmental justice, Sager offered a sage perspective on how government, the philanthropic sector and the communities both serve will need to come together around a shared understanding of the climate challenges Southern communities will face in the coming years. “In my experience, elected officials are pretty much saying ‘Pfft, I’m not going to worry about this. [Climate change] is not going to happen for 70 years, and I’m not worried about running for office 70 years from now,’” she said. “And when the environmentalists have meetings about climate change, they often don’t invite community leaders and activists. What Sager and her peers understand is that climate resiliency for already marginalized communities is an urgent need and that those communities have the skills and the leadership to build that resiliency. But few funders have met that potential with the investments to make it a reality. One foundation that has begun to invest in a holistic understanding of climate and community resilience specific to the threats faced by Southern communities is The Kresge Foundation. The Kresge Foundation, which began investing in New Orleans in the 1950s, significantly ramped up its contribution in the aftermath of Hurricane Katrina. Beyond supporting disaster recovery, the foundation has focused on expanding social and economic opportunities for New Orleanians. Today, the foundation finds itself looking to increase its impact on the city, including by investing more deeply in climate resilience strategies. Post-Katrina was a critical time for the region, and the money that came was large in scale and highly responsive, Rush said. New Orleans has been the focus of attention for many national foundations since Hurricane Katrina in 2005, and Rush was not the only person to mention an opportunity for more coordination among funders. Foundation interest in New Orleans has run the gamut: education, economic development, arts and culture, housing and infrastructure have all seen philanthropic support in the years since Katrina, with all areas still facing challenges. The Kresge Foundation is engaged in the city for the long-term, and their perspective on the successes and challenges of the post-Katrina philanthropic response as well as partnerships with organizations on the ground has led them to a specific investment strategy. Climate change will bring more severe storms, more intense rainfall, more days of extreme heat and new tropical diseases to New Orleans, Rush noted. “Flooding is a critical problem now and a growing risk as climate change progresses, posing in some cases even an existential threat for low-income people who live in New Orleans,” she said. After spending a year speaking with members of philanthropy, government and community organizations in New Orleans, Kresge believes that there is an opportunity for the philanthropic sector to do much more. The concept of resilience is responsive to the region-wide understanding that climate change will challenge individuals, communities and systems in ways yet unseen and still unknown. Climate change resilience begins on the individual and family levels with building assets that can help secure a vulnerable family’s basic needs under challenging circumstances. At the community level, climate change resilience will require building community voice and power, so residents can advocate for their needs and broadcast their perspective as society mobilizes to meet the climate change challenge. It will also require community cohesion – that sense of linked fate that comes from a shared understanding of Southern communities’ past and future – so that power can be built from within marginalized communities, instead of being diminished by outside forces. At the systemic level, if equitable results are to be achieved, it will require a flexible, responsive infrastructure of public and private sector entities that recognize the fundamental need for social inclusion in resilience decision-making. Climate change resilience will also demand a resilient nonprofit sector. Rush pointed out. In spite of the challenges faced by nonprofit ecosystems in the South, Southern communities and their leaders are forging a cross-sector movement for environmental and climate justice that has the potential to move the whole region – and the whole nation – forward. Colette Pichon Battle, executive director at the US Human Rights Network, saw for herself the potential that lies in healing, reconciliation and responsive decision-making in her time as director of Gulf South Rising (GSR), based in Southern Louisiana. A native of New Orleans, Battle spent more than a decade helping build the power of marginalized communities across the Gulf Coast to respond to climate threats. GSR is a regional movement created to spotlight the disparate impacts of climate change along the Gulf Coast. Among other accomplishments, GSR built on the leadership already present in communities most affected by climate change in the Gulf Coast region and created new leaders, shifted the regional narrative among grassroots organizations from climate resilience to resisting unjust systems that support environmental injustice and established a community controlled grantmaking fund that continues today. In 2015, the 10th anniversary of Hurricanes Katrina and Rita, GSR released its final report. The document outlined the outcomes of years of organizing and articulated a path forward for communities threatened more each day by rising seas and other environmental challenges. The key infrastructural asset that propelled GSR forward was the initiative’s deep roots in communities who had been and would continue to be most impacted by environmental injustice. In a series of people’s assemblies held over five years across the Gulf Coast, GSR generated a strategy document that continues to guide their work. The assemblies began five years after Katrina and concluded just a few weeks before the BP oil spill. The nonprofit infrastructure in the Gulf South had at that point “begun connecting the dots around climate, race and pollution, but they wanted to find out what the people wanted to be done – what are the people’s priorities?,” Battle explained. Central to GSR’s success was the initiative’s ability to turn reactive energy into a movement – to transform what had seemed before like localized crises into a regional challenge. The extractive economies frame was potent for GSR’s work, because not all parts of the Gulf South could relate to Southern Louisianans’ experience with extractive industry; in places like Southwest Florida no such industry exists. The broader frame of extractive economies could better apply to the challenges communities across the region had experienced with educational systems and mass incarceration, for example. In addition to aligning around a shared understanding of the Gulf South’s challenges, GSR responded to one of the needs communities frequently identified when they asked: collective healing and reconciliation. Environmental injustice in the South is built on decades of communities being neglected and outright targeted for marginalization. The extractive process Battle described whereby the powerful take from the land, poison the people and reap a profit has left a long shadow of trauma in many Southern communities. Battle explained why foundations interested in investing in the South must reckon with that reality. “It was our Black community leadership in New Orleans who have nothing to do with the nonprofit sector or the movement language who asked for healing,” Battle said. “When we did people’s assemblies and asked them what it is they needed, they said ‘We need to heal. And if we don’t heal, we won’t get anywhere.’ If we don’t heal ourselves, our relationship with our creator, our relationship with our neighbors, our relationship with the earth, we are in for eradication. When funders fail to understand and respect this dynamic, their Southern investments fail to meet their expectations, Battle said. That trauma does not mean that Southern social change leaders are not equipped to accomplish amazing things, Battle continued. The shared history of extraction and exploitation is what makes Southern relationship-building, and therefore movement-building, possible. What infrastructure does Battle see in the South now? Historically, poor people and people of color in the South have forced to live in flood plains, Sager said. Thus, poor rural communities in the South will be disproportionately affected by climate change. But to have resilience there needs to be something from which to build wealth and power, she said. Climate change presents an exponential and existential threat for people across the South – and for the nation more broadly – but foundation grantmaking to date does not reflect that reality. Southern communities’ and our national complacency with racialized poverty puts whole communities and the whole region in greater danger from climate crises. Hurricane Katrina was the clearest and most tragic illustration of that complacency and its real cost in dollars, in community trust and in lives. The political and economic deprivation at the root of entrenched poverty stretches from the dislocation of Native peoples to enslavement and disenfranchisement of African Americans through the exploitation of poor Appalachian communities and continues today in the marginalization of Hispanic immigrant communities, among other ways. Our national economy has prospered and continues to prosper as a result of these forms of marginalization, and we share responsibility for making it right nationally – all of us. Southern communities need to be whole in order to remain resilient in the face of ongoing climate crises – culturally, socially, economically and politically. Philanthropy within and outside the South has a key role to play in supporting Southern leaders who seek to build that community cohesion necessary to overcome environmental threats. When foundations prioritize protecting communities from climate shocks, those communities will be empowered to lead on other environmental goals like protecting physical ecosystems and regulating harmful industries. In the end, environmental self-determination is the most sustainable and effective path to climate resilience. For all the challenges Southern communities have faced, and for all the deep personal and communal wounds that persist because of the region’s history of racial oppression and violence, the more than 100 interviews that informed this research echoed two refrains: Southerners take care of each other, and Southerners are deeply, personally invested in their home – in their land. That history of mutual aid and rooted community life is, as with most things, complicated. But the truth it holds represents perhaps one of the South’s most valuable assets given the growing threat climate change presents. Climate change is already deeply, irrevocably affecting Southern communities – especially poor communities and communities of color that were relegated for centuries to land most vulnerable to flooding, pollution and dislocation. And just as these vulnerable communities have for centuries made a way with what they have, Southerners are on the leading edge of developing new ways to live together with each other and with our changing climate. Climate change resilience work is inherently and fundamentally intersectional in the South. Southerners understand that the same moneyed power players who profit from extraction and exploitation of the physical environment also profit from artificially cheap labor, from private prisons and from other ways of exploiting human resources. What’s needed is a comprehensive strategy to build the power of grassroots organizations that truly represent the communities they serve to challenge this entrenched status quo. Grassroots leaders like Naeema Muhammad, Rev. Mac Legerton and Donna Chavis are fusing environmental, economic and racial justice strategies to seek a holistic solution to the challenges their communities face. Deeply rooted funders like Mikki Sager, Liza Cowan and Erika Wright are leveraging the capital at their disposal to build the nonprofit infrastructure needed to sustain grassroots power. And larger national funders like Chantel Rush and the Kresge Foundation are trying out bold new strategies informed by their grassroots partners, bringing to bear their expertise and immense resources. It is time for other foundations – both in the South and nationally – to meet these pioneers where they are and bring their own resources to the table. Any funder concerned about health, economic prosperity, access to opportunity or the physical and spiritual survival of coastal communities can and must find a way to invest in Southern climate resilience. Based on conversations with nonprofit leaders, advocates and funders across the South, there are certain characteristics foundations need to look for when they seek a Southern organization that will leverage philanthropic investments for greater impact. And there are some qualities that funders over-emphasize in their search for Southern partners, to the detriment of the foundation, grantee and community. The work of building effective, long-term relationships of trust in cross-sector, cross-issue, cross-constituency coalitions to meet the climate change challenge head-on is difficult, and it is perceived as too risky for many potential partners to engage in the first place. Funders interested in real impact need to commit significant resources –financial, human or otherwise – to signal to other partners that they can trust funders’ long-term, deep engagement. 2. Do seek to understand the holistic history of Southern communities’ relationship to the land. Land is the South’s most basic and abundant natural resource. National funders and even Southern foundations need to understand the complicated history of land use, allocation and dispossession in Southern communities in order to support a holistic environmental justice strategy. 3. Do look to intermediaries as key partners in making your investments more accessible to grassroots grantees. Absorbing capital on the scale required by even midsized foundations is a significant challenge for many grassroots partners. The right intermediaries are high-leverage investments that build out the sustainability and capacity of Southern organizations and build a bridge between those organizations and direct funding streams. 1. Don’t rely only on established funding streams to well-resourced Southern organizations. The environmental nonprofit subsector is infamously over-concentrated in a few organizations, which is as true in the South as it is nationally. Instead of only funding established organizations with long track-records, seek out ways to build new funding streams to new grantees. Working with good intermediaries or collaborating with other foundations to pool resources is one effective strategy. 2. Don’t dismiss existing infrastructure. When funders decide existing nonprofit infrastructure does not meet their needs and instead build something new to their designs, it undermines Southern capacity and autonomy, and frustrates key local partners and efforts. Funders must recognize existing social change infrastructure – both formal and informal – and increase their investments in making that infrastructure more representative, inclusive and effective rather than starting their own. 3. Don’t expect to be in the driver’s seat. Funders bring substantial financial resources, human capital and significant expertise to the complicated, cross-issue challenge of climate change. But when they expect to drive the process of developing and executing on a holistic strategy to address that challenge, they displace and disrespect community expertise and community voices. Be humble; bring all the resources you have at your disposal to help solve the problem but let communities most affected by environmental issues lead. Photo by Gaut.Chris, used under Creative Commons license. 1. Identify opportunities to fund climate, economic and social resilience and solutions in the South within current grantmaking priorities or expand priorities to include those strategies. Build learning relationships with other funders who are already leading in this space. If you already make climate-related investments, ensure they center the needs of people and communities most impacted by environmental challenges. If you already include an equity lens in your funding, consider what justice means in the context of preserving and utilizing natural resources. 2. Deploy your financial, human and political capital to ensure underrepresented communities – those most impacted by environmental injustice – are meaningful partners in climate resilience conversations. Use your political and reputational capital to invite community representatives to the table with business, government and philanthropy. Fully engage grassroots partners in designing your environmental grantmaking strategies. 3. Seek reparative, healing, honest relationships between grantee and grantor and within grantee communities. Acknowledge the full history of Southern communities’ relationships to the land and ask grassroots organizations how to learn about that history. Lean in to conversations about the real and perceived harm done to Southern communities in the name of racism, class-ism and other discriminatory practices. Acknowledge your and your foundation’s shared complicity in that history, too. 4. Make a healthy, resilient social change infrastructure a strategic priority. Collaborate with other funders and develop a shared understanding of what infrastructure assets already exist. Ask grantees how they can best collaborate with other social change agents to address climate change issues instead of competing with them for funding, then fund that work. Don’t just expect collaboration to happen on its own. Consider what investments in grantee human capital might be required to increase resilience, e.g., grantee employee benefits, leadership development, etc. Consider the whole ecosystem of social change agents instead of singling out charismatic Southern leaders for support. Southerners understand how to build resilience and address the environmental challenges they face because of natural disasters and unjust environmental policies. But as communities build power and resilience, and people migrate to the South, especially to cities – from the rural South, the North and other parts of the world – communities are changing quickly and cities are expanding. Reactionary policies can quickly stifle the voices and the power in these communities. How can foundations and donors support communities in building movements to address a changing urban South? Find out in the next report in the As the South Grows series, which will explore how communities are building movements and working toward an equitable and prosperous future in Atlanta.